I know this is a detour from my normal content, but I just have to share this blog from a group of Columbia College students who are traveling in Costa Rica right now. I backpacked across Costa Rica when I was a student at CC, so I’m thrilled to read about these young ladies! My trip to Costa Rica made a big impact on me … mentally and physically! I carry a reminder of what I learned there in the form of a tattoo: Pura Vida. It means “pure life” and is a popular saying in that country. I could write an entire blog post about the natural beauty I saw or the kindness and warmth of the people I met, but for now I just want to wish these young women a beautiful and transformational adventure. Pura Vida, Koalas! Learn more about Columbia College at http://www.columbiasc.edu. The boat ride was amazing, and it led to the most incredible little hotel tucked away in the depths of the rain forest. 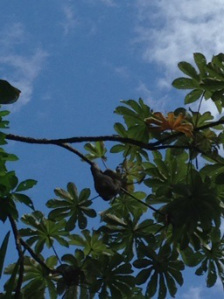 The shade provides a nice break from the heat and the trees are home to howler monkeys and more sloths! After checking into the rooms and a bit of pool time, we took a boat again to the town of Tortuguero, which is full of fascinating history. 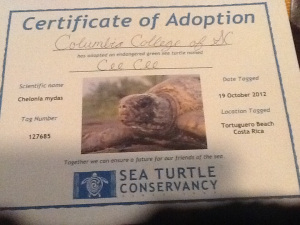 We learned about the work being done to conserve the sea turtle, and Columbia College adopted a sea turtle! The town of Tortuguero is gorgeous and friendly. The people were nice, the stores were interesting, and there were so many precious dogs running around. There are no cars allowed in the town, so it was lovely to meander from store to store without traffic to bother us. I’ve had this recipe from The Cheese Pusher pinned for a long time but haven’t gotten around to trying it. Well, I finally had the perfect opportunity last week: our semi-regular Sunday dinners with my husband’s brother, wife, and wonderful daughter! I needed something easy and something cheesy because everyone loves cheese. 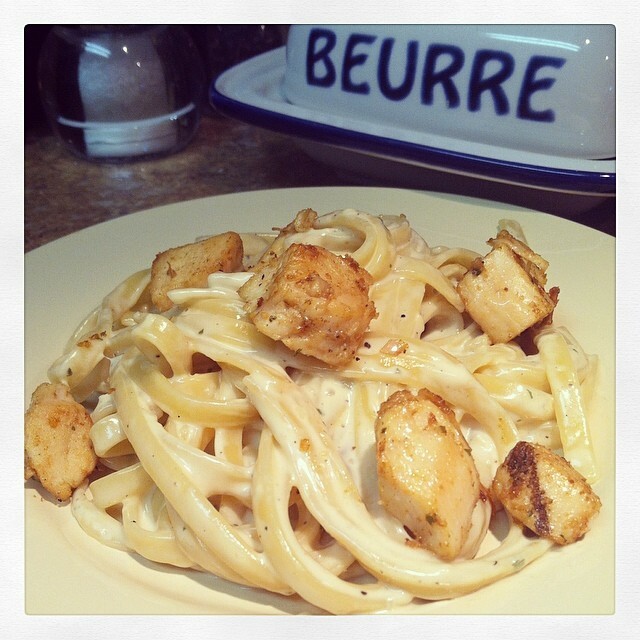 🙂 The original recipe is pretty much perfect; I didn’t change a thing, other than using fettuccine noodles and cooking up some cubed chicken in a skillet with butter, garlic, and poultry seasoning. Obviously, it was delicious because I’ve made it again already!